With the widespread use of the automobile in the Ozarks, ferries instead of fords became the common method of crossing small Ozark rivers. 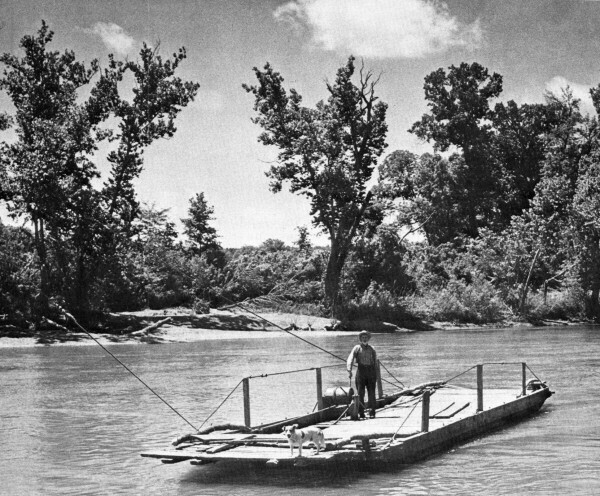 Moore's Ferry on the White River, pictured above about 1943, used the river current for power and cables to hold it in place. Photo courtesy Townsend Godsey from OZARK MOUNTAIN FOLK. Dawn is just breaking & a car pulls up to the river crossing. As the driver waits for the ferryman to come out and take him across the river, he impatiently toots his horn, introducing a foreign sound into the quiet, fog-shrouded valley. The sound of the horn brings the countryside to life--both in the valley as the startled birds chirp frantically, and in the house, where the ferryman gets out of bed, knowing that it is the start of a long day. This early morning scene happened many times at the ferry locations on the Ozark streams from the early 1900's to as late as the early 1960's. Since most of the rivers in south central Missouri are not very wide and narrow frequently over riffles shallow enough to be easily forded with horses and wagons or buggies, ferries were not needed nearly as much before the automobile era. The roads and trails led to the fording places which were spaced every few miles. In normal weather the streams posed no travel difficulty for horses. However, the automobile did have difficulty crossing the fords. The narrow wheels got bogged down in the gravel or mud bottoms. If the ford had any depth to it, or the water 'raised any, the engines would flood out. The ford crossings became such a problem that often the nearest farmer was literally kept busy pulling people out with his team. Obviously as more and more people got cars, there was a demand for better crossings. Where bridge construction was too expensive, the solution was a current-powered ferry as near the original ford location as possible. So for many years, until the crossing was abandoned or a bridge built, ferries operated on many streams including the Current, St. Francis, White, Gasconade, Eleven Point and Niangua. However, certain conditions had to exist before the ferry would be successful and not everyplace had a ferry where there was once a ford. First, the ferry had to be on a main-traveled road with enough traffic to make the operation financially successful. The approach and banks on either side had to be suitable for automobile traffic and landing points for the ferry. Above the flooding point on either bank, there had to be something permanent, either a tree or post, on which to fasten the cable that held the ferry in the river. The river had to be at least three or four feet deep to float a loaded ferry and the current had to be strong enough year-round to provide the power to push the ferry across the river. Getting up at dawn was just one example of the confined life of the ferryman of past days, as he had to be on duty twenty-four hours a day, seven days a week, year-round. He never had any time off unless he could hire somebody to run the ferry temporarily. Some ferrymen, during especially busy summer seasons, even put a cot out on the ferry. If a customer came along blowing his horn at two in the morning, the ferryman would get up, take him across, go back to bed and sleep until someone else would blow his horn. Often running the ferry was a family operation. At many crossings, since traffic alone wasn't enough to provide a living for the ferryman and his family, ferrying was combined with other businesses. Since everyone on both sides of the river for miles around had to cross the ferry to go anywhere, the crossing became a good location for a country store, a mill or a blacksmith shop. As the community grew, the post office was usually located in the store at the ferry. There was much more to ferrying than just taking the boat back and forth across the river. Many crossings were under the jurisdiction of the county court. In that case, each year he paid a ferry fee of about ten dollars to operate the ferry. He was sometimes responsible for building the ferry in the first place, and he was always responsible for keeping it in running condition and seeing that the approaches were maintained twenty-four hours a day. Then, the fare money that he received for the crossing was his. It would be difficult to estimate the income of a ferryman. Euel Sutton said, "In the summertime, in the peak of tourist season, it was quite a bit, but in the wintertime, there wasn't many customers. And if the roads were bad, you didn't have any traffic. There was no way you could get a count to average it." 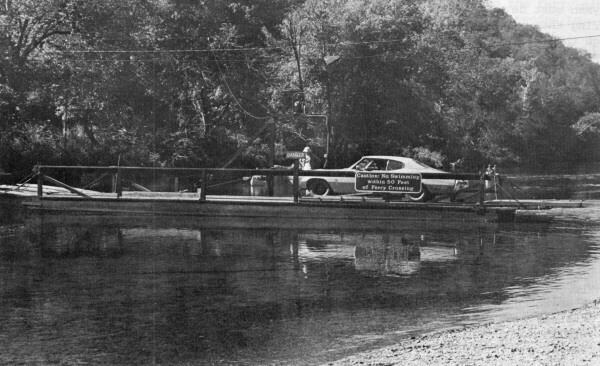 Modern motorists still cross the Current River at Akers, which is in the Ozark National Scenic Waterways, in a wooden ferry approximately 48 feet long by 18 feet wide. Notice the cables across the river and the triangular pulley, all of which help guide the ferry and hold it in place. Mr. Sutton remembered that when they first started the Powder Mill Ferry on the Current River, it cost ten or fifteen cents a vehicle to cross, "And if the customer didn't have the ten or fifteen cents, then some of the local farmers, if they were there with a loaded wagon, could bring potatoes, turnips, peaches, apples, whatever he wanted, and they'd trade them for the crossing. Kind of a barter system. Then as time went on and more cars got on the road, the fare went to twenty-five cents per car per trip of a daytime. Then of a night when you had to turn your lights on, it went to thirty-five cents. "World War II came along, and then gas rationing took place, so the price stayed up all through the war. Then in '46, '47 traffic became a lot heavier, so they finally started raising the price, and then as the years went by, the car was seventy-five cents and a truck was a dollar because of the heavier load, and a dollar of a night." Some ferries changed hands fairly often. The operators expected to earn more money than they were able to make. When they had trouble making ends meet, they sold out. One ferry we found still operating was at Akers in the Ozark National Scenic Riverways. The ferryman there has a much easier life than the old-time ferryman. To cross the ferry, the motorist rings a bell. Someone in the nearby store answers the call, or on not-so-busy off-season days, one of the men working there in the store or at the canoe rental business on the bank takes the car across. Today's customers, not used to waiting, sometimes curse or bawl out the ferryman if he is slow to get there, as undoubtedly did customers in times past. The ferryman must develop a thick skin, ignoring them as he prepares to cross. 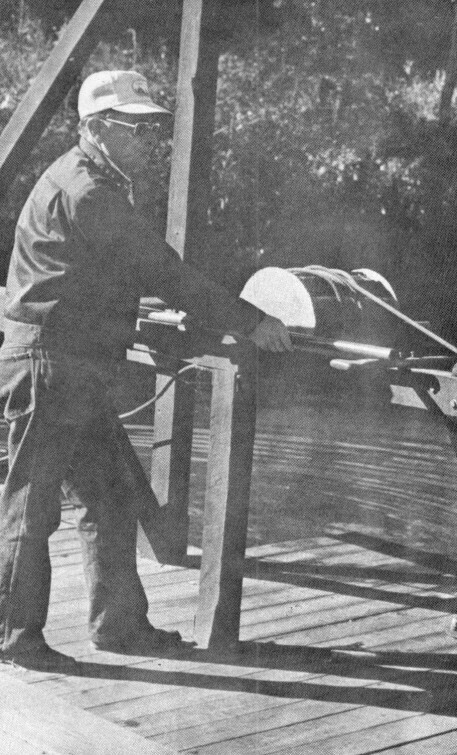 Though the ferry is built with an oar-board to use the current power, to make the Akers ferryman's job still easier, the ferryman makes use of an electric motor to scoot the ferry across the river and another motor to pump out the water from the hull. The design of the current-powered ferries was not complicated. 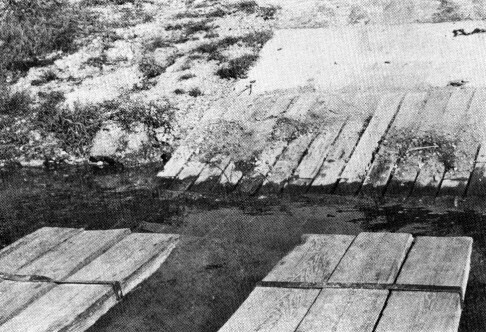 They were constructed of wood at the crossing site. Depending on the traffic, they were made just long enough for either one or two cars and usually just wide enough for one car. They were floored over, flat-bottomed floating hulls, designed so that they did not float very deep in the water. The framework of the hull was the gunnels. These were usually four wooden planks eight to ten inches thick, about two to three feet deep and as long as the ferry--some about twenty-five feet long. The gunnels were sawed at a slope on each end for approaching the bank. Since the ferry did not turn around, each end was identical. Held in place With supports, they were boxed in all around to form the hull, and the boxing boards were caulked to be watertight. Then the two by six floor boards were laid. Because it was impossible to completely waterproof the hull, three by three trap doors were built into the floor to allow the ferryman to get in and scoop out the water with a shovel. He didn't allow water to accumulate to add more weight to the ferry and make it ride lower in the water. 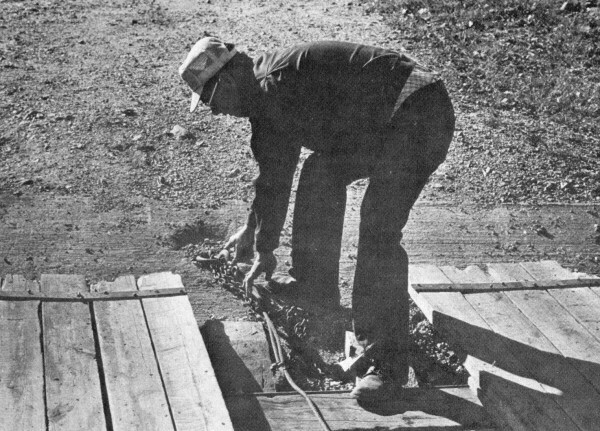 The trap doors also allowed the ferryman to get inside the hull to work on the bottom of the ferry, repairing leaks or punctures. Fastened below the upstream gunnel was the oar board. 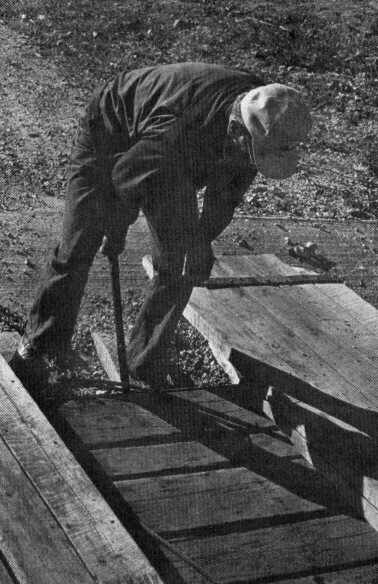 The oar board, made usually from a two by six, was held in place several inches below the gunnel by supports. At each end of the ferry, there was what was called a wing or apron. These were hinged to be raised or lowered, depending upon which bank the ferry was approaching. In the stream they were usually both up, though not all ferrymen raised them. When docked, the appropriate wing was lowered. Sometimes ferries had loading ramps or boards built on the wings which actually lay on the bank to make it easier for the car to drive on the ferry. Along both sides of the ferry there was a precautionary railing about three feet high. These were usually just a few posts holding boards, rope or wire. The several trap doors in the floor of the ferry enable the ferryman to get in the hull to scoop out water and repair leaks and punctures. To keep the ferry from going downstream, a continuous cable runs from the ferry through a triangular pulley on a main cable crossing the river. To secure the ferry to the bank, the simplest device was a rope or cable thrown over a stob in the ground or a handy tree. Some ferries had winches, pulleys and cables with a hook on the end. The winches used to tighten the cables, were in the upstream corner of each end of the ferry. 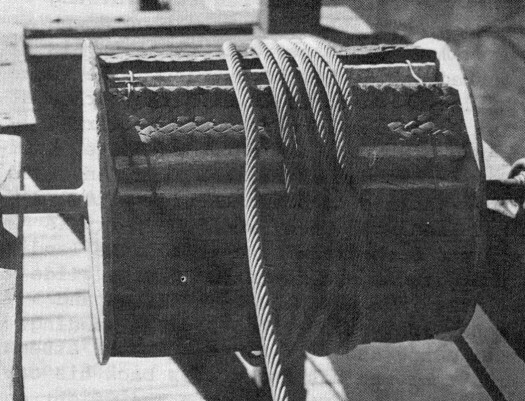 A cable went from each winch to a pulley mid-point in the end and then off the ferry where the hook was fastened to a ring anchored on the bank. Besides the actual ferry itself, there was machinery to keep the ferry in place. Stretching across the river and fastened to a stationary tree or post on each bank, was the main cable, which was usually about 3/4th inch in diameter. The ferry was fastened to this big cable with smaller cables or lines. 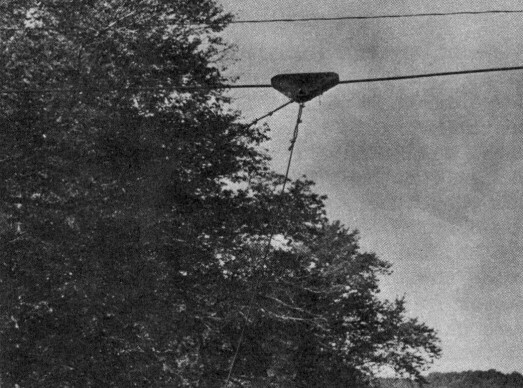 Riding along the main cable was a big triangular pulley, suspended with the point hanging down. A long continuous line ran thrOUgh this point first to the pulleys anchored on each end of the ferry. Then from each end pulley, the line was wrapped several times around the windlass, located about mid-point of the upstream side of the ferry. The windlass was a circular wooden tub-like device about a foot in diameter with a handle to enable the ferryman to turn it. Turning the windlass would shorten one line and lengthen the other, thus pointing the ferry either upstream or downstream as needed to control the ferry in the current. There are three basic operations in running a ferry. They are loading, crossing and landing. To load a car onto the ferry, the ferryman first makes sure the ferry is fastened securely to the bank and the wing is down, making a ramp to drive on. He then motions the car onto the ferry and has the driver pull clear to the front. The weight of the car on the front raises the rear to help the ferryman pry away from the bank. To leave the bank, the ferryman must unfasten the line to the bank. If there is a winch, he must loosen it and unhook the cable from the ring on shore. After doing this, he has to pry the ferry away from the bank with a pole and jump on. He then raises the wing. Normally the quickest way between two points is a straight line, but if a ferryman tried to take an old-fashioned ferry across the river in a straight line, he would have trouble. He must take it across slantwise, like a side winder, for the current, going down river, not across, would take the ferry with it. Also to use the power of the current and to control his speed, the ferryman pointed the boat either upstream to cast off or downstream to land. Hence the sideways movement. Today, most ferries are mechanically powered so they usually can travel in a straight line since the motor has more power than the current. The continuous cable going through the big pulley also goes through single pulleys located at each end of the ferry. 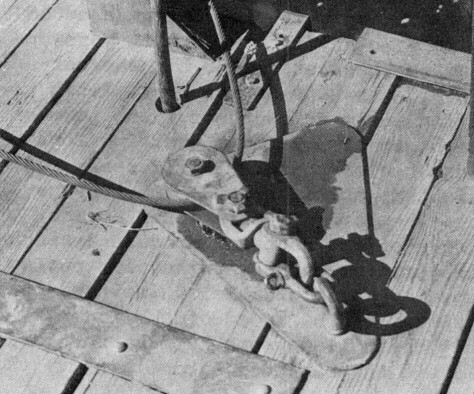 From the single pulleys the continuous cable wraps around a windlass located midway on the upstream side of the ferry. 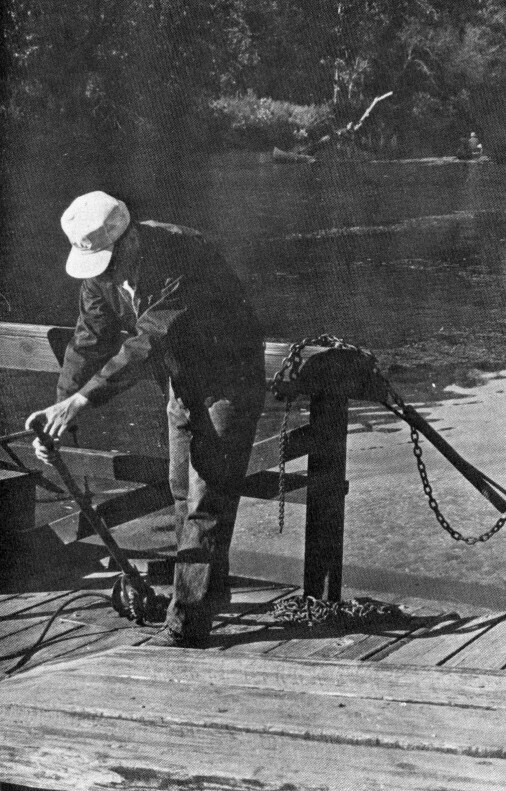 To use the power of the current to cross the river, the ferryman points the ferry upstream using the windlass, pulleys and continuous cable until over half way across. He then turns back downstream to land. The general principle of using the force of the current to cross the river is really quite simple. To cross the river, the ferryman turns the windlass, which in turn pulls the lines through the pulleys to point the ferry slightly upstream. Held by the big cable strung across the river so it can't go downstream with the current, the ferry is pushed across by the current. The force of the current, as it hits the oar board and goes over it and under the ferry, causes forward movement. When over halfway across the river, the ferryman turns the windlass to point the ferry toward the landing. Then, when the ferry is turned downstream to approach the landing, there is enough momentum left to glide gently into the bank. The lines and cable prevent overshooting the landing. Once the ferry is out in the stream, the ferryman has the driver back his car to the rear of the ferry. The weight on the rear raises the front end slightly, making the approach to the landing easier. Many times drivers would be afraid to back their cars for fear of backing off. The ferryman would then do it for them. Some incidents did happen when the driver backed too far so that the rear wheels went off the ferry. Though it was frightening, there was usually no harm. Some men would push the car back on to the ferry when the ferry reached the other bank. If, for any reason, the ferry should stop in midstream, the ferryman gets his ferry pole, a dried pole approximately fifteen feet long, three inches in diameter, and manually pushes the ferry the rest of the way across the river to the landing. There was sometimes slight difficulties in controlling the speed of the ferry. The only way the ferryman could slow it down any was to turn it more upstream so that less water hit the oarboard and the side of the boat. This position would allow the current to move straight through without exerting force against the oar board. 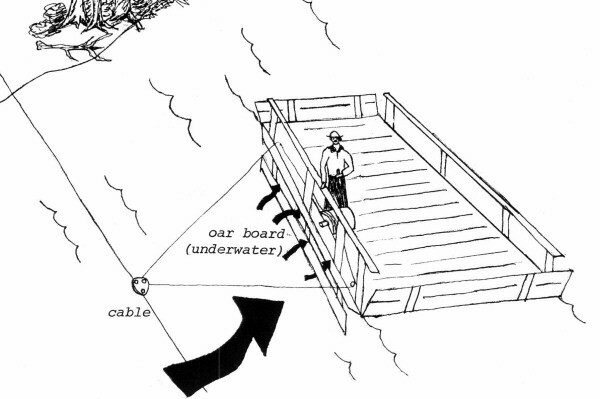 If the ferry was straighter (at right angles to the current), the force of more water against the side of the boat would cause a tauter cable, forcing the big triangular pulley to move on the big cable at greater speed. Sometimes, if the speed of the ferry wasn't controlled properly, the ferry would hit the bank too hard. (1) Pulling to front of ferry raises back when leaving bank. (2) Midstream, driver backs car to back so (3) its weight raises front for unloading. Held in place by cables and pointed upstream, the ferry is pushed across the river by the force of the current going over and under the underwater oar board. The large arrow indicates river current direction. After coming in contact with the bank, the ferryman must lower the wing, jump off and fasten the ferry securely to the bank. The car may then drive off the ramp and go on its way. There were many hazards involved with the operation of a ferry, but the most costly to the ferryman were sinking, ice and flooding, as these did the most damage to his ferry. The ferry would not sink often, since the ferryman was always alert to avoid water in the hull. Even though builders used tar or pitch to seal the cracks, a ferry still leaked some. During a twenty-four hour period, it might leak an inch or two over the whole ferry. Water also got in the hull from rainfall leaking down through the floor. 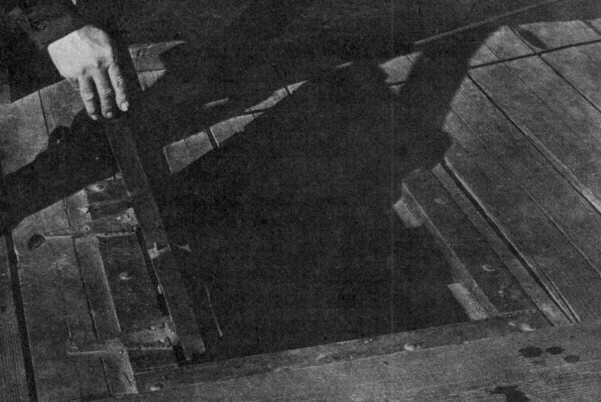 So, using the trap doors in the floor to get into the hull, he had to bail water out every day to avoid water buildup. Occasionally a ferry would sink during a flood, or sometimes a rock would punch a hole without anyone knowing it, so that during the night enough water might build up to sink it. If anything like that did happen, to recover it, the ferryman had to use pumps that would pump the water out of the ferry faster than it was running in. Ice was another danger. The problem wasn't the ice in the river, but the added weight of ice frozen on the ferry, for if enough ice got on the ferry, the weight could possibly sink it. When ice accumulated on top, the only solution was to chop it off with a pole or break it off any way possible. Very rarely would the river freeze entirely over. The current was usually strong at the ferry crossing, and most of the rivers were fed by spring water which normally kept the river temperatures above freezing. Mr. Sutton said of the Current River, "I could remember ice coming down only two or three times in my lifetime. Big chunks of ice would float down the river, huge chunks, and in old times, way back in the 1800's, she'd freeze over. People drove across in wagons. Now I've seen that. "The Current River is fed by springs all the way from Montauk to below Big Spring--and the spring water stays a minimum temperature of 58° year round. Therefore, the river has a fluctuation of warm water and is rather hard to freeze over." Flooding was probably the most common natural hazard, since Ozark rivers rise quickly during heavy rains, sometimes six inches an hour. Because of this, the ferryman had to constantly watch the water level. When the river reached a certain stage above normal--two to five feet, depending on the particular river--the ferry had to be shut down. As the water was rising, to keep the ferry out of the current, the ferryman had to keep pulling the ferry up in the road, and as the water receded, he had to gradually lower the ferry back into the river. Failure to keep the ferry pulled up might result in its being washed downstream, and failure to lower the ferry back into the falling river might result in its being stranded until the next high water. Another flood damage resulted from trees and logs being swept downstream. Should one of these hit the ferry, the force could be enough to sink it, or snap the main cable or lines, washing the ferry downstream. During flooding times the ferryman stayed up all night to keep watch on conditions. If possible, he might pull the ferry to a cove away from the current until the river subsided. Flooding danger could happen anytime of the year, but was most frequent in the spring. Depending on the size of the rivers, most would crest and fall within a twenty-four hour period after heavy rain. 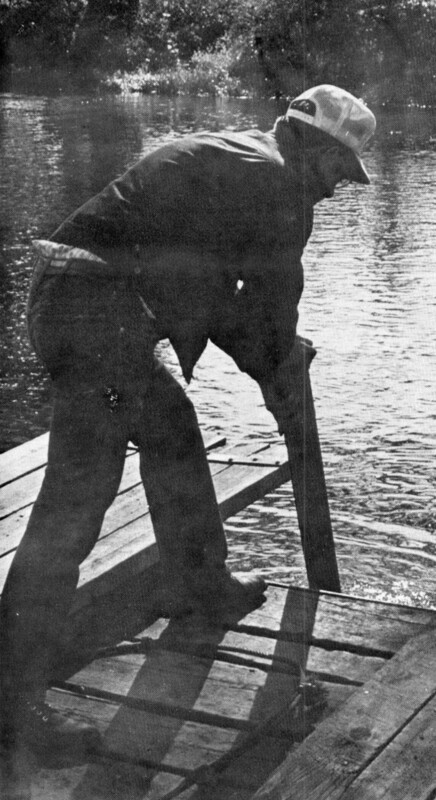 When the water receded, the ferryman had to repair the washed-out landing, fix the approaches by hauling in clay and other materials, remove any debris left in the way, as well as inspect the ferry and make any other necessary repairs, such as broken railings, repair any new leaks and, of course, scoop out water. Even without flooding, water levels fluctuated so that some ferry locations had special high water hookups for the ferry. 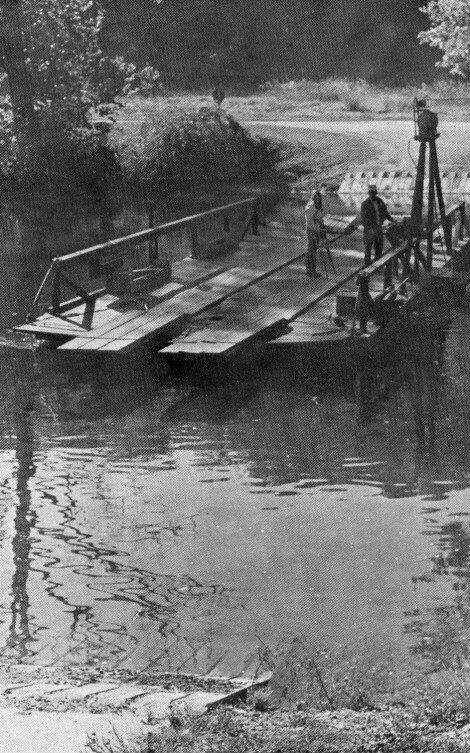 Ferries with permanent concrete landing ramps on the bank made provision for higher and lower water levels. In the opposite extreme, sometimes in summer or early fall there would not be enough water. This condition, though not as potentially dangerous as a flood, was of major concern because it caused the ferryman greater work. During a drought, rivers occasionally got so low that the ferryman had to scoop out the gravel from the landing approach to enable the ferry to get close enough to shore to unload the cars. Also, if the river became sluggish enough that the current wouldn't take the ferry across, the ferryman would have to pole the ferry to and fro across the river. It is difficult for modern motorists to envision all the work and trouble it used to be just to cross a river they could easily throw a rock over. Used to speeding on high bridges over streams they hardly notice, most would be frustrated and impatient to have to stop, wait in turn and then one or two cars at a time, float at a snail's pace across a hundred foot river. But, on the other hand, some motorists drive miles out of the way just to experience riding a ferry. They consider it an adventure into the past to drive on to the rattling, unstable ferry and glide silently to the other bank. To leave the bank Jim Purcell first loosens the winch to relieve the pressure on the line holding the ferry to the bank. He next unfastens the ferry from the ring anchored on shore. Above--After prying the ferry from the bank, he guides it across the river (below) using the windlass. There are very few current-powered ferries left, except for places such as Akers in Ozark Scenic Riverways, where, for old times sake, a ferry still crosses the Current River. Either because there wasn't enough traffic to make them economically feasible on out-of-the way crossings, or because bridges were built to replace them on heavily traveled roads, one by one the ferries have disappeared. If the ferry stops for any reason, the ferryman has no recourse but to pole it on across. Jim gives Linda Lee a free ride across the river. If handled correctly, the ferry will glide gently and squarely on to the landing.